On the everlasting mission of becoming a better developer, I’ve read ‘Metaprogramming Ruby‘ by Paolo Perrotta. The book gave me some great insights and inspired me create some more cheat sheets for my big secret cheat sheet project. For now I’ve created two and will post the first later this week. For those interested in the contents of the book. If you are looking for a better (read total) understanding of the Ruby object model, interested in Eigenclasses and all sorts of advanced programming techniques, grab a copy! I think it is a great read! Warning: I can’t think up something practical about what I prefer and explain below! Don’t say I didn’t warn you! Last week I found myself writing a method ending with a question mark, but it wasn’t returning a Boolean. Just as most of the other methods ending with a question mark I wrote the last couple of years it returns either a NilClass instance, which evaluates to false, or some other object instance, which evaluates to true. The question I want to answer is if such a method should return true or false or is returning nil or some object good enough? Personally I think it should return a boolean value. I have more arguments opposed to returning a bool than not, but it just feels right, seems more logical. But! if there are humongous performance implications, I’m also happy enough with the way I did it before. 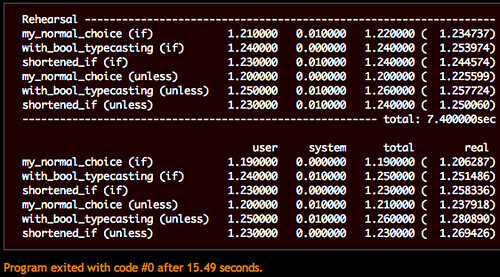 The test results show, I’m running the code 1 million times, that the difference is marginal. So for me the only logical conclusion is that returning a boolean, which feels more logical to me, is perfectly acceptable and will be my weapon of choice starting as of right now. If you have a practical use to actually justify this, please let me know! Because there are too many things I like to do and because I also find myself spending a whole night in front of the television and wondering afterward what I’ve seen, I’ve decided to structure my free time a bit more. It seems quite contradictory to structure your free time, but the last years I’ve found that if I don’t do it – at least a bit – I won’t get anything done. I need to set goals for myself and apply some basic structure to work towards those goals. So to take the bull by the horns I’ve declared Tuesday evening as my “learning evening”, Wednesday as my “blogging evening” and Thursday as my “pet project evening”. Right now, I guess cause I write a bit in advance, she just started with book 4. I’m also trying to get here started in some other series I really like, but she wants to stick to one series at a time. I myself don’t really mind reading in several series at once. I must admit I do prefer series over a single book. There is more, I’ve read two series from Tad Williams and the first three series from Robin Hobb (stopped in book two of the fourth, too depressing!) Two questions. One: Do you read simultaneously? and Two: Which series do I absolutely have to read (and why)? Just finished ‘HTML5 For Web Designers‘ by Jeremy Keith. It is a short but comprehensive guide into the world of HTML5. If you haven’t, like me, took the time yet to dive into HTML5. This is definitely a great start and a must read. For those who are already experimenting with HTML5 and regularly visit the W3C or WHATWG sites. I guess that there are probably no surprises in this one for you. And your public is not grasping what you try to explain. Because I’m determined to make my blogging adventure a bit more successful this time, I’m reading up on blogging tips. I find this article about becoming a professional tech blogger quite inspiring, but unfortunately it is not very concrete about the do’s and don’ts in the blogosphere. There are a lot of sites around the web dedicated to help people like me create a good/better blog. Some that seem useful at first sight are http://www.dailyblogtips.com/, http://www.toptenblogtips.com/ and http://www.problogger.net. At first sight, because obviously I have to try things out and see if they work. One of the things I can’t find, but probably read somewhere in the past, is ‘Have some posts on the shelves’. By doing this I give myself some more time to review my articles more thoroughly, but the most important reason is that this helps when I might have a writers block for a few days. If I create an article buffer for myself I think this prevents virtual deadline stress So above all this is something I’m going to stick to and when you are reading this I am probably busy with writing or checking an article you can read somewhere in the near future. Oh… and just in case you are wondering, I’m not planning to become a pro blogger! I like my current work too much for that, but it never hurts to read some professional tips. Though I think for some blogging is easy, I’m sure that most people experienced their blogging adventure somewhat the same as I did. stopped writing. The same happened about three times. Starting today I’m going to give it another try. Why? Basically the 37Signals book ‘Rework’ motivated me to do so and I strongly believe that I will learn more when I write about it. Will people be interested? I don’t know, I’ll see. The least I will get out of it, is learn more and that alone is worth the effort. I’ve recently bought several books, Rework, Made to Stick, The Tipping point, Delivering Happiness, Metaprogramming Ruby and also a bunch of fantasy books. I’ll start with writing about what I read, so I have to rethink what I’ve read more thoroughly. From time to time I might write about the things I experience in day to day life. I can’t guarantee if I will keep writing this time, but I’ll definitely put in my best to make it work this time!